This frame shows some lower office buildings and workshops in the foreground. Behind the office buildings are more of the low dormitory buildings. Behind these, and the power lines, are several large buildings of unknown use. These buildings are close to the main Shipping and Receiving facility, on the road leading to the NTS, and to the Mercury gate. Quite possibly they are used as storage for supplies and parts. 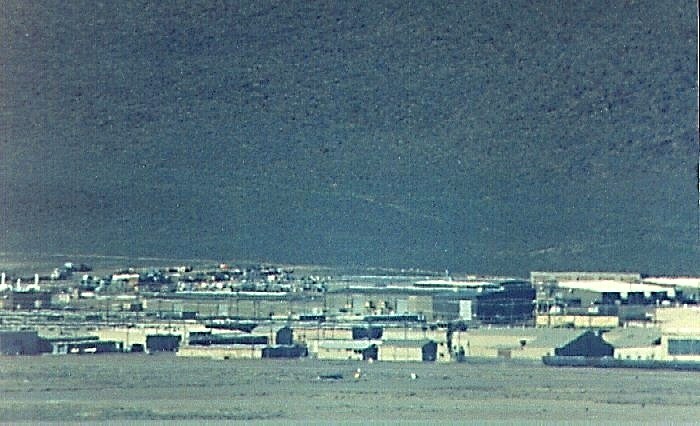 The hangars with the gray roof on the right are the original U-2 hangars from the early days of Area 51. They were constructed during the 1950's to house part of the U-2s (they could not fit in whole). These are probably Buildings 217 and 220. In the foreground is part of the old taxiway to the original runway 14/32. Barely visible at the bottom of the frame is the northern holding pad of that runway. However, this runway is no longer used, as can be seen on recent satellite photos.